Cool air, freshness of the morning and fairly empty streets. I honestly cannot think of a better way to start a spring day than going on a walk with a friend. Freshly brewed coffee and a favourite magazine could compete? Nay. There is nothing better than a morning walk. Recently, I went back to my home-town Warszawa to spend time with family and friends. It was a great time filled with reflection, laughter, relax, interesting chats and, of course, walking. I couldn’t resist. On the last day of the stay I met a very good friend for last one morning meeting before going back to England. We met at 8am, to be precise, and headed to a local park – Morskie Oko*. We walked, we chatted, and we breathed in the morning atmosphere, reflecting on motherhood, work and life. Children going (or rather scootering) to school, brave morning runners and dog owners with their pets – that all surrounded us. Idyllic. Morskie Oko has a special place in my life as this is the park that my dad went to as a child, our parents took me and my brother to when we were young and later on I strolled there with my friends during high school and uni years. On one of the visit my husband met there another Ethiopian who ended up being best man on our wedding and a good friend of the family. The park is always on the way and guarantees a place to escape from one of the busiest streets in the city. So strolling across this park with a friend, looking over the hills and ponds is one of essential things for me while being in Warsaw. But the morning walk can be done anywhere. Even if you stroll along Oxford Street, if you can call that strolling, or have only ten minutes to wander around your local park it’s worthy to use the opportunity. Maybe you can walk through back streets and grab a coffee and a croissant (in Warsaw I would grab one of the sweet buns with poppy seed, cheese or curd...mmm)? Or look above your head and admire the architecture or a blue sky on a good day? Maybe, like me every day, you can only walk along the canal, watch cats playing and ducks wandering too far from the water? Appreciate that! The morning walk, no matter how long or how short, how beautiful or how ugly will give you a time to concentrate before a busy day, pray, think, meditate and start the day afresh, filled with new energy. 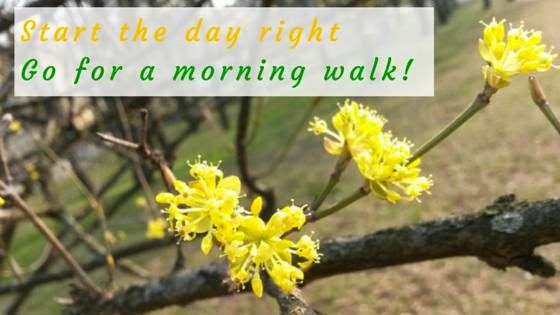 And morning walk benefits go way beyond just that - it may even change your life like in one Bollywood movie with surprising title... "Morning Walk". After the stroll around the Morskie Oko, I went to a bakery to buy fresh bread and in another shop I bought fresh lettuce and tomato for breakfast. O, how different they tasted after such a great beginning. And how different the next day looked when the same friend asked by me how her day began, replied that it wasn't as good as the one before. I couldn’t agree more. *I’ll not attempt to translate the name but you can look it up – just write in google ‘Morskie Oko Warszawa’. If you write the name without the city you will probably be transferred to a website about Morskie Oko in Tatry Mountains on the other end of Poland.